A PDF version of this article appears in the April 1, 2016 issue of Executive Intelligence Review and is re-published here with permission. FRANKFURT, March 23—The seminar, “Solving the Economic and Refugee Crises with the New Silk Road!” organized by EIR in cooperation with the Consulate General of Ethiopia in Frankfurt, Germany, was attended by an audience of 75, consisting of representatives of several diplomatic offices, subscribers and contacts of EIR in the region, and about ten Syrians (students as well as refugees waiting for enrollment at universities). Several contacts came from as far away as Berlin and cities in Switzerland. Extending over the entire afternoon, the seminar featured presentations by Helga Zepp-LaRouche, chairwoman of the Schiller Institute; Hussein Askary, EIR Arabic Editor, Stockholm; Mehreteab Mulugeta Haile, Consul General of the Federal Democratic Republic of Ethiopia; Marcello Vichi, former Director, Foreign Department, of the Bonifica company and author of the Transaqua concept; Andrea Mangano, Vice President, Italian Association of Water Engineers and contributor to the Transaqua outline. The speakers were joined by Mohammed Bila of the Lake Chad Basin Commission and Ulf Sandmark of the Schiller Institute Stockholm and Swedish-Syrian Committee for Democracy, for an expanded panel in the second part of the seminar. 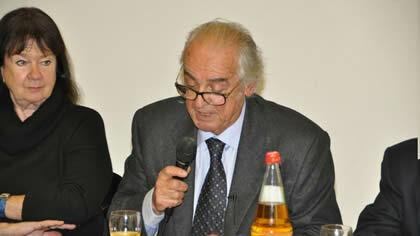 The seminar was moderated by Claudio Celani of the EIR’s European center in Wiesbaden. Helga Zepp-LaRouche, who led the conference, is flanked by Marcello Vichi, author of the Transaqua concept for rescuscitating Lake Chad (right), and Claudio Celani of EIR Wiesbaden, the conference moderator. In her keynote address, Zepp-LaRouche stressed that this would not be an academic seminar but rather a discussion about the fact that in this existential crisis of mankind, shown by the refugee crisis, the wars and the financial crash, solutions are within reach and must be realized now. In the wake of the terror attacks in Brussels yesterday, it is more than appropriate to recall former U.S. Senator Bob Graham’s statement of mid-November last year after the terror attacks in Paris, that had the classified 28 pages of the Joint Congressional Inquiry into 9/11 been made public, such atrocities could and would have been prevented. It is beyond any doubt that the Russian military intervention into Syria changed the rules of game, that it exposed the role of that pro-ISIS alliance of Saudi Arabia, Qatar, the United States, and United Kingdom, and particularly the role of Turkey, whose policies have been attacked harshly by two former U.S. ambassadors to Ankara. The European Union agreement with Turkey on containing the refugees is a travesty which fits into the general picture of Western and U.S. human rights violations, which have just been exposed in a Chinese dossier. While the West is talking about an insanity such as “helicopter money” to save its own speculative banks, the Chinese “One Belt, One Road” initiative presents an offer for a win-win strategy based on the real economy; that is, a strategy that is not just in the interest of China but also of the other nations—and real development only will help to dry out terrorism. Either Europe works with Russia, China, India, Iran, Egypt, and other nations to launch a Marshall Plan for Syria and Africa, or its bankrupt economies will crash against the wall, Mrs. Zepp-LaRouche said. 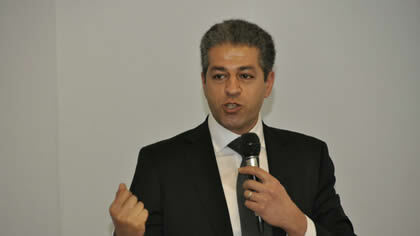 Hussein Askary from EIR, Arabic translator of "The New Silk Road becomes the World Land-bridge". Presenting the EIR World Land-Bridge report in its first Arabic translation, Hussein Askary reported that as this seminar was being held in Frankfurt, an event presenting the Arabic report was also taking place in Yemen that same day under conditions of continued Saudi airstrikes on Yemeni cities. The idea of the New Silk Road is more than just building a few roads and railroads; it is a concept of development corridors improving the life of some 450 million people in the Southwest Asian region, with Syria being at the center. This involves mega-projects of rapid development, financed by national development banks free of the obligation to pay unpayable debt as demanded by the Western monetarist institutions. Like Egypt, Syria will focus on industrial zones, transport corridors, and agricultural development, with China showing the way with its massive infrastructural engagement, for instance in East Africa. The conference on “Solving the Economic and Refugee Crises with the New Silk Road” was held in Frankfurt, Germany, in cooperation with the Consulate General of Ethiopia on March 23. Here, Consul General Mehreteab Mulugeta Haile reports to the conference Ethiopia’s rapid development. Ethiopia is currently negotiating with Brazil, Russia, and India to finance and build rail links to Kenya, South Sudan, and Djibouti. China and Turkey are already partners for other routes. Ethiopian Consul General Haile followed with a presentation on the economic strategy of his country, characterized by policies that have greatly improved per-capita income, literacy, and public health care since the 1990s. With an envisaged annual GDP growth of 11%, Ethiopia seeks to become a middle-income country by 2025, made possible by opportunities for Ethiopians to set up a farm or shop at the price that many pay today to human traffickers to be brought to Europe as refugees. Ethiopia itself is the largest refugee host in Africa, having taken in 800,000 refugees from South Sudan, Somalia, and Eritrea—a fact that no one in Europe talks about. Ethiopia will be transformed from a primary-products exporter to a nation with high-value production and infrastructure, and the country’s cooperation with Russia, China, India, and Brazil in rail projects is important in this context. Marcello Vichi reviews the 35 year history of the Transaqua Project. Marcello Vichi then reviewed the history of the Transaqua Project discussion over the past 35 years, from the first proposals presented by Italy’s Bonifica company in 1982-1985, to African governments and the UN pointing to a transfer of water from the giant Congo River as the only viable option for refilling Lake Chad. The proposal has largely been met with disinterest or pessimism as to the chance of its realization and has been discarded as allegedly “megalomaniac,” but the recent refugee streams have made Europe rethink its views, and Transaqua, which has always meant more than just water for Chad—but is rather the broader framework for the development of all of Central Africa—is the only option that can attract the young generation of the African labor force, so that it will not become refugees. 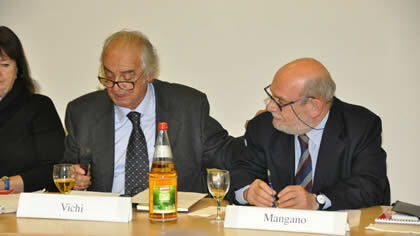 Marcello Vichi introducing Andrea Mangano as a leading proponent of the Transaqua project. Andrea Mangano then presented an overview of what Lake Chad was 35 years ago and what it is now, with 90% of its water lost. It shares the problem with other evaporating inland lakes in the world that are no longer supplied by their traditional tributaries—the Aral Sea (Uzbekistan/Kazakhstan), Lake Urmia (Iran), Lake Turkana (Kenya), and the Dead Sea (Jordan/Israel). The process is only reversed by water transfer and reduced consumption by irrigation using new technologies. This is what Transaqua does; it will tap 5% of the water from the upper tributaries of the Congo River, water that otherwise flows unused into the Atlantic Ocean in a volume fourteen times that of Germany’s biggest river, the Rhine. Refilling the lake will be accomplished with infrastructure construction that will give the entirety of Central Africa hydropower, irrigation for agriculture, and waterway transport, and will relieve the region’s present land-locked condition. Mohammed Bila of the Lake Chad Basin Commission elaborated on the Transaqua issue in the expanded panel, pointing to the large and ongoing migration wave southwards from Chad since the great drought of 1973, during which Lake Chad lost 40% of its water inflow. The farmers and their cattle that have migrated to the south will not return to Chad unless the lake is refilling, and unless the terrorist movement of Boko Haram has been crushed. Ulf Sandmark reported on his two visits to Syria in 2014 and 2015, during which it became evident that the reconstruction of Syria actually implies the development of the entire Southwest Asia region, making it an integral part of the New Silk Road—to which he found the Syrians open, and when the “Phoenix” reconstruction plan drafted in Stockholm was presented to the Syrians during the second visit, it received broad coverage in the country’s media. The panelists’ discussion with the audience featured additional aspects of what was said in the presentations, including the genocidal tradition of the British Empire, which has sabotaged real development in Africa and the Mideast; the hopelessness of the monetarist system; and the increased threat of a thermonuclear world war if the chance to change course toward cooperation with the New Silk Road is not taken by Europe and the United States; and that we are in a race against time to enter a new paradigm before the total collapse destroys everything. It was raised that, contrary to Western black propaganda, China is not engaged in Ethiopia for raw materials, since Ethiopia has none, but instead is a real partner for development. Zepp-LaRouche repeatedly insisted during the discussion that the participants of this Frankfurt seminar take home with them the commitment to set fire to the behinds of the policy makers to force a fundamental change, that a real mass movement for development has to be created. Vichi made a passionate appeal that there is good reason for optimism, and that the change requires that we work from that optimistic basis. A new and creative image of man, as it was developed in the great Italian Renaissance, is required also today, Celani pointed out. Sandmark insisted that the New Silk Road is not just for engineers, but for everyone to study at seminars and chapter meetings. The first chapter meeting on the Arabic language report in Yemen today was actually being presided over by the leading poet of that country, Askary added.